Historical data can tell us a lot about what to expect moving forward. Right now, when the market is depressed and prices are low, it’s difficult to pick coins. FUD is everywhere, so you never know which coin might 100x during the next bull run, and which coin might fizzle and disappear. I’ve spent the last few days trying to decide which altcoins, if any, I should be moving funds into to take advantage of bear market prices. It’s been difficult, but what I’ve found is two coins offer a much higher probability of large returns than any other. To do this, I’ve simply analysed market caps of the top coins during each previous bull and bear cycle. Let’s take a look. 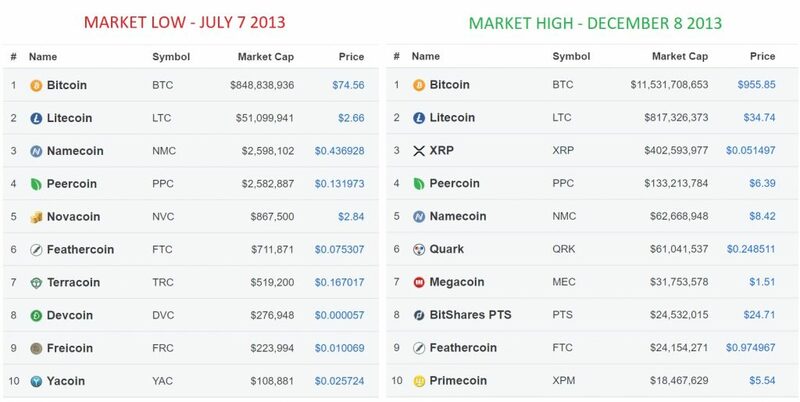 Of the coins that were in the Top 10 at the market low, only 5 remained in the Top 10 when the market hit a new high. Those were Bitcoin, Litecoin, Peercoin, Namecoin, Feathercoin. The coins that fell out of the Top 10 were Novacoin, Freicoin, Terracoin, Devcoin, Yacoin. Those coins fell out of the Top 10 to #11, #13, #17, #21, #28. 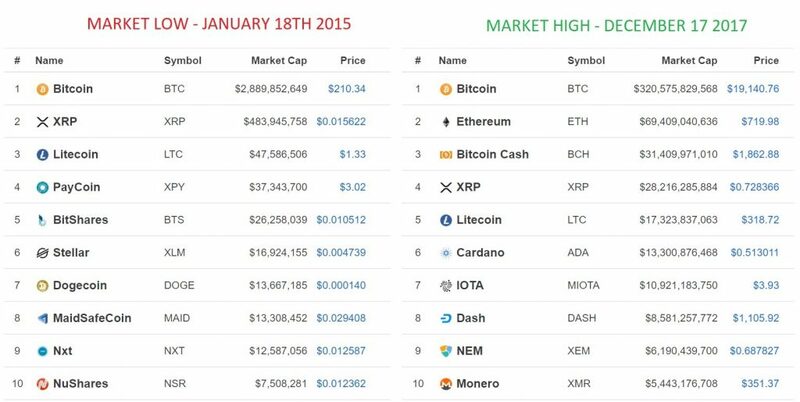 This means during the 2013 bear market, if you had invested in any of the Top 10 coins, you would have made at least 9.9x on your investment, and could have made up to 63x. At least in this particular cycle, investing in any Top 10 coin would have been a very high probability play. Of the coins that were in the Top 10 at the market low, only 3 remained when the market hit its new high. They were Bitcoin, XRP and Litecoin. The coins that fell out of the Top 10 were Paycoin, Bitshares, Stellar, Dogecoin, Maidsafecoin, Nxt and Nushares. The returns were particularly high in this market cycle. 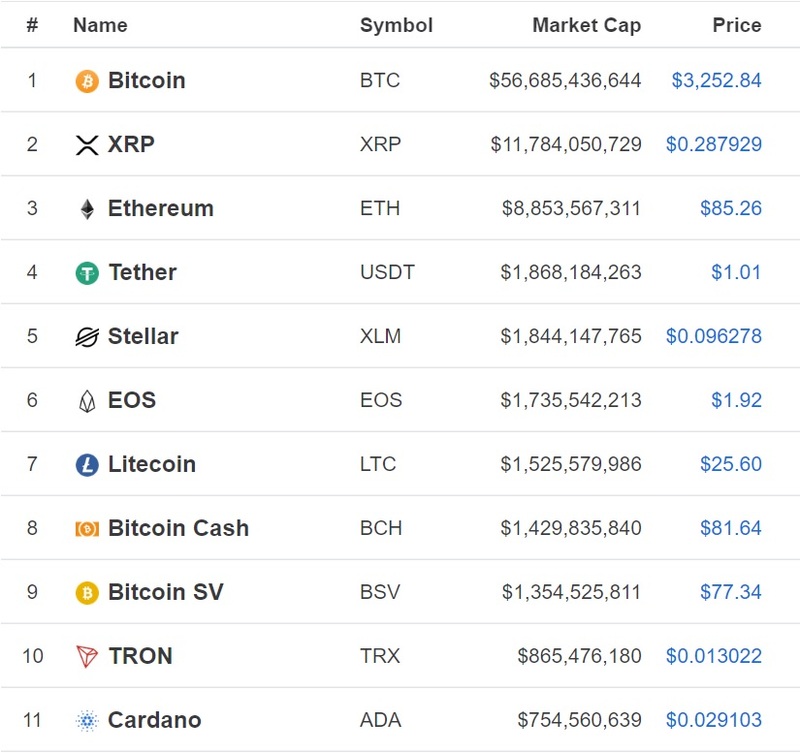 Investing in the Top 10 coins would have made you anywhere from 12x to 270x. The outlier here is Paycoin, which turned into dust and would have lost you 95% of your investment. If anything, that shows you the importance of diversifying if you’re planning on going the altcoin route. Market cycle #3: December 2018 to ? Bitcoin hit a low of $3,252 on January 16th 2018. This is not a confirmed low, as we still have not broken through to a new high yet. When that happens is anyone’s guess, although I have made my prediction here. What should we invest in today? The obvious high-percentage choice is Bitcoin. It has been the top coin through all market cycles, and returned 15x during the first cycle and 93x during the second. The third market cycle will likely produce very high returns as well. 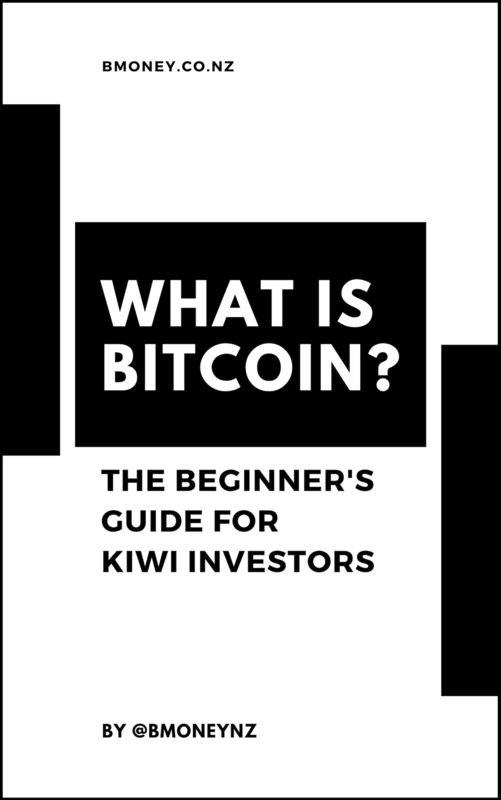 What many don’t realise is the entire stability of the market relies on Bitcoin. If Bitcoin fails, all trust will be lost, and the market will likely collapse, possibly beyond repair. The highest probability bet is always Bitcoin. Litecoin is the only other coin that has stayed in the Top 10 through each market high and low since its inception. Litecoin returned 18.7x in the 2013 bull market and an impressive 270x in the 2017 bull market, meaning it outperformed Bitcoin both times, and still remains in the Top 10 today. It’s a very high probability choice. Those are my two high percentage picks to invest in right now. XRP emerged in the 2013 bull market with an impressive run and has remained in the Top 10 since. It performed very highly in the 2017 bull market, and sits at #2 in market cap today. I personally don’t find XRP appealing as its fundamentals are weak according to our analysis, but regardless it seems to be a good performer. If your research tells you its a solid investment, history would be on your side. Stellar was a Top 10 coin during the 2015 bear market, and has performed strongly since then. Along with XRP, it’s one of the few coins that’s showed development and staying power outside of the Bitcoin/Litecoin combo. Our analysis also says Stellar’s fundamentals are solid. History also says this could be a good investment come the next bull market. No other coins have stayed around long enough for them to be cemented as picks, based on this data alone. My conclusion from this is investing in Top 10 coins during the bear market is a very high probability play, and gives such solid returns that choosing coins outside the Top 10 isn’t really necessary. Since July 2013, there has only been one coin (Paycoin in 2015) that didn’t return at least 10x during the bull market cycle. The two highest probability picks are Bitcoin and Litecoin, as they’ve occupied top spots ever since their inception, neither have experienced any hacks or downtime, and both continue to develop with strong teams. 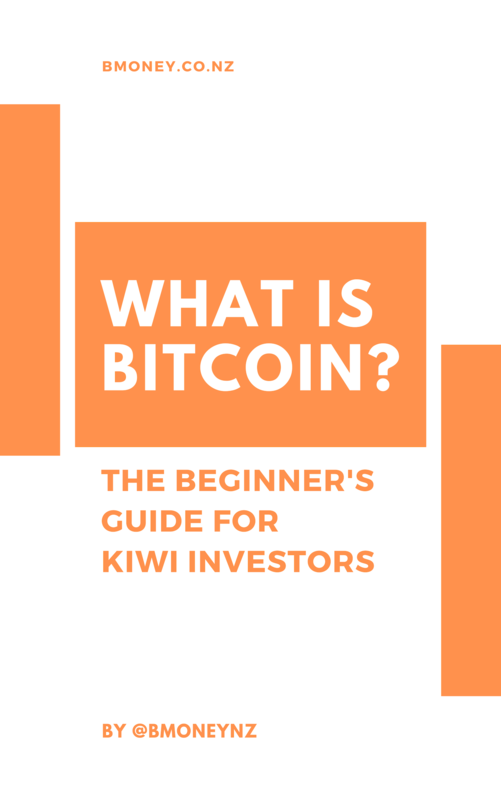 Both also achieved good scores in their fundamentals analysis (see Bitcoin, Litecoin). If you’re looking for the lowest risk cryptocurrency investments, those two would be wise picks. Once again, the information in this article is not financial advice, I am not your financial advisor, and encourage you to do your own research and consult your own professionals.